1. The accusers. Moore portrayed his first four accusers as pawns of the Washington Post, which reported their allegations. Since then, five more women have come forward, mostly speaking to outlets other than the Post. With one exception, the nine women don’t know one another. They’ve given their names and answered hard questions, in some cases on live TV, while Moore has stiff-armed reporters. Each woman has told only her own story, but there are hints that they’re just the tip of the iceberg. One recalls Moore telling her, “I go out with girls your age all the time.” Two of the women say they supported Trump. Another says she’s a Republican. A fourth calls herself a devout Christian. Yet Moore and his allies continue to dismiss all the allegations as a liberal plot. 2. Supporting witnesses. One accuser, Leigh Corfman, says Moore seduced her when she was 14. Moore says he never met her, but Corfman’s mother says she was present when the two met. Another accuser, Wendy Miller, says Moore flirted with her when she was 14 and asked her out at 16. Her mother, too, confirms the story, saying she told Moore he was too old to date her daughter. Kayla McLaughlin, who worked at a mall store with a third accuser, Gena Richardson, says she saw Moore pursue Richardson. Two other accusers, Beverly Nelson and Tina Johnson, told their sisters about Moore years ago. The idea that all these girls, their mothers, their sisters, and their friends began coordinating a massive lie decades ago—and somehow conspired to keep it quiet through Moore’s many previous political campaigns, saving it for a special Senate election in 2017—is completely preposterous. And that’s before we get to the many other people in Moore’s town, including a colleague in the district attorney’s office, who have broadly described, in some cases firsthand, how Moore fished for teenagers. 3. Documents. A February 1979 court order supports Corfman’s contention that she was down the hall from Moore’s office on the day she says they met. Moore’s campaign says Corfman’s story about where Moore picked her up for dates can’t be true because she didn’t live where she claims to have lived. But an old police report confirms that she did. (When the Post asked the Moore campaign to document its counterclaim that Corfman lived a mile away, the campaign replied: “We will not respond to anyone from the Post.”) Another court record shows that Johnson was a client of Moore in 1991, when she says he groped her. Moore’s campaign has attacked Nelson’s story that he assaulted her 40 years ago outside a restaurant. The campaign has questioned whether the restaurant existed there at the time, and Moore’s wife has promoted claims that it didn’t. A 1978 city directory confirms that it did. Moore has also denied allegations by Corfman and another woman, Gloria Deason, that he gave them alcohol when they were underage. Moore says he couldn’t have done that, because the county didn’t permit alcohol sales at the time. This, too, is false: The county had legalized alcohol sales several years earlier, and the restaurant where Deason says Moore ordered bottles of Rose confirms that it served booze. 4. The yearbook. Moore says he never met Nelson. 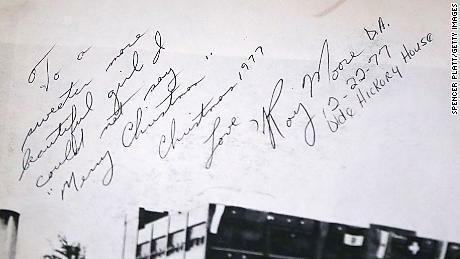 That leaves him to explain why she has a 1977 high-school yearbook bearing the inscription: “To a sweeter more beautiful girl, I could not say ‘Merry Christmas.’ Christmas, 1977, Love, Roy Moore.” Moore points out that Nelson, too, has something to explain: Why, he asks, are the exact date and place where he ostensibly signed the yearbook written below his name “in a style inconsistent with the rest of the yearbook inscription”? That’s a good question. It’s possible that somebody else appended those details. But what’s striking is that Moore doesn’t challenge the inscription itself. He can’t dispute that it bears an uncanny resemblance to his handwriting on other documents. An expert consulted by the Post observes that the script flows without interruption, which would be hard for a forger to do. At a Nov. 15 press conference, Phillip Jauregui, an attorney for Moore, questioned whether “everything written in that yearbook was written by Roy Moore.” That sounds like an implicit acknowledgment that part of it was. (Nelson’s attorney, Gloria Allred, says she’ll hand over the yearbook if Moore agrees to testify, along with Nelson, under oath. Moore hasn’t accepted the challenge.) 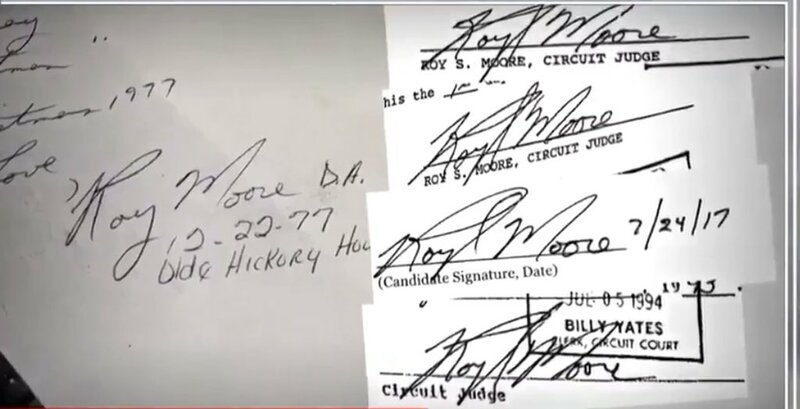 It’s also curious that Moore’s campaign, which has dug up old documents bearing his signature, has yet to produce any that don’t match Nelson’s inscription. And the yearbook itself nails down that the inscription was written in late 1977, when Moore was 30 and Nelson had just turned 16. So even if you discount the appended text, we’re left with Moore’s note to a “beautiful girl” half his age, whom he claims he never knew. 5. Confessions. Moore says he first noticed Kayla Kisor, the girl who would become his wife, when she performed at a dance recital at age 15 or 16. That would be around 1977, the same year that three of his accusers, who were roughly the same age as Kisor, say he pursued them. In fact, Nelson was in Kisor’s high-school class. And though Moore told Hannity he did “not generally” date teenagers while in his 30s, he also denied “dating any girl without the permission of her mother,” which suggests that the girls were young. 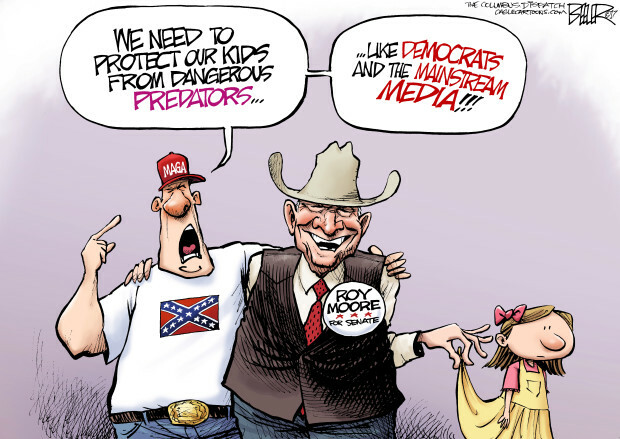 That fits the story told by Wendy Miller’s mother, who says she rejected Moore’s request to date her 16-year-old daughter. . . .
Like anyone else accused of wrongdoing, Moore began with a presumption of innocence. But he has forfeited it. His assertions are demonstrably false. Too many witnesses, documents, and self-incriminating statements have discredited him and substantiated the case against him. You can still plead, as Trump does, that voters should look past the allegations because Moore “totally denies” them. But that’s not a serious argument. It’s an excuse to ignore what Moore did.